The bacon class I am teaching on Sunday is a go (it's not too late to sign up)! So, this week I've been doing final recipe testing, which included a dessert. A couple friends came over to sample the cookies that night, and I took the rest to school where a few students and teachers tried the cookies. Everyone seemed to like them. So, what do they taste like? The cookies themselves are similar to shortbread, not very sweet and kind of crumbly; I think the icing is essential. The bacon isn't very prominent either. They are, instead, reminiscent of a pancake and bacon breakfast...really good with morning coffee! Fry the bacon over medium heat until crisp and drain on paper towels. In a mixing bowl, combine the flour, butter, egg, and cream & mix until well-blended. 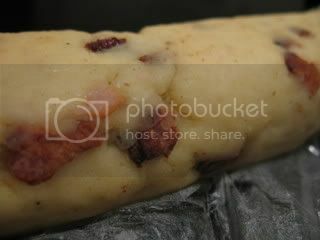 Add the bacon and knead until the dough is soft and the bacon is evenly distributed, about 1 minute. Roll the dough into one or two logs about 1 1/2 inches thick. Wrap in plastic wrap and chill until firm, at least 2 hours. Cut the dough into 1/4-inch thick slices & arrange the slices about 1 inch apart on a lightly greased cookie sheet (use a bit of the bacon grease or use a silicone mat). Bake until the cookies are firm and very lightly browned (they won't get golden brown), about 12-15 minutes. Transfer the cookies to a rack to cool. 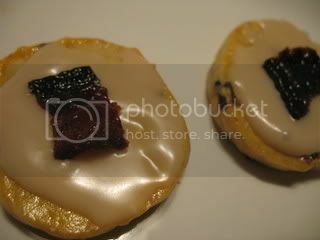 Then, spread with maple icing and top with a small piece of candied bacon (recipes below). You don't really need a precise recipe for these. For the icing, I mixed some powdered sugar (let's say about a 1/2 cup) with some Grade A real maple syrup (let's say 3 tablespoons). But really, I didn't measure. I eyeballed it...adding a bit more sugar, then a bit more syrup until I got the right consistency. You want it to be thick enough to spread...unless you want it think enough to pour. It's really up to you. But, you MUST use the good syrup here, NOT the maple-flavored stuff. Ice the cookies when they are cool. The candied bacon is just as easy. 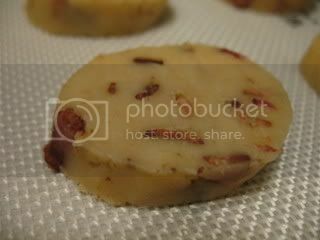 Lay several slices of maple bacon on a cookie sheet. Be sure to line the sheet with a silicone mat or use a sheet with a baking rack on top. Coat each bacon slice with light brown sugar. Bake in the oven until the bacon is crisp, about 25 minutes. I cooked the bacon with the cookies and just kept checking it. The bacon will turn a deep mahogany color; don't be alarmed. When it's done, let it cool on the rack with the cookies. Then, cut it into small piece to put on top of the cookies. Hmmm.... bacon cookies - I could do that. Yum! Wow, this could be seriously amazing.. Ever since my loved one encouraged me to eat bacon with marmalade i've been interested in a sweet take on bacon :) This is definitely worth a try. Whoa! I've never added pork to my cookies. You are a brave soul! MY! MY! MY! ...talk about my kind of recipe! YUM!! I love that the cookies themselves aren't sweetened. I like the whole bacon in dessert/sweets but sometimes the recipes are just too sweet and too much. I've got to make these! Wow! I had lost track of your blog somehow recently: yay twitter :) And this is a stonking post to come back to!! Nope, there's no sugar in the dough. That's why I added the maple glaze to sweeten it up. My dough turned out REALLY crumbly. Is that supposed to happen? Your looks so soft and creamy. I remember my dough being crumbly, too. After I shaped the log, I wrapped it in plastic and chilled it for quite a while. I sliced it very carefully.